"This is music of a metallic nightmare" wrote a reviewer of the music of Alexander Mosolov. 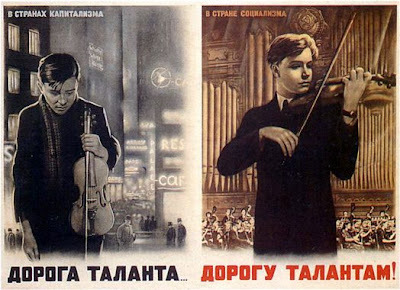 Born in Kiev in 1900 Mosolov wrote "socialist realist" music in the USSR during the 1920s including the work recorded on the shellac 78 above which is variously described as coming from A Symphony of Machines or a ballet called Steel. More information from the excellent webrarian.co.uk or listen online to the record here. The "B-side" of the disc features a work evocatively titles "the Dnieper Water Power Station". This is scored mainly for percussion and celebrates the building in 1932 of what was the largest single hydro-electric plant in Europe on the Dnieper River in Ukraine. The composer is Yuli Meytus who was born in 1903 in Elisavetgrad. Again more at webrarian.co.uk and listen online to the music of a water power station here. 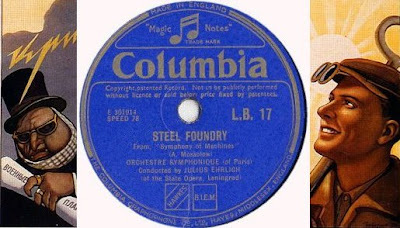 Many thanks to prolific 'path finder' Walt Santner for uncovering the musical gems, enjoy more of Walt's research here. There is an incredible NAXOS re-issue of the Mosolov conducted by de Sabata, which includes a very good work by the conductor called Juventus. Sabata, as a whole, is sadly neglected these days, so it's good to be reminded how much he championed new music. 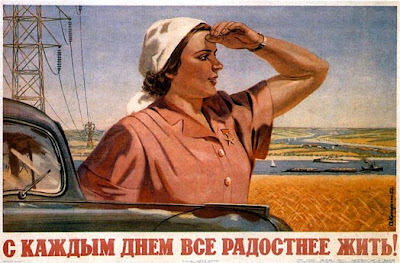 In terms of 1920s Russia, this piece is rather patriotic, so to speak - at least on a working class level, which is precisely what 1920s Russia was all about!! However, it's not a particularly enjoyable piece of music. It's very modern and avant-garde. I have no doubt that Stalin would've (and probably did) hate it - which is ironic given the title bears his name! !